Formulated for Industrial and Environmental use. Eradicates offensive odours from tower block refuse chutes. Controls sewage farm and refuse dump odours. Sweetens and freshens drains and settling tanks. Powerful effective biocide restores hygienic conditions, antimicrobial value (BS 6471) - QAP 70. For refuse tips, dustbins, refuse chutes, sewage farms, offal treatment plants etc. For general use spray affected area with solution of Reosan in water. Always spray at source of odour. May be drip fed into sewage. 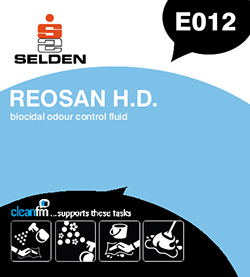 General deodorising: Add Reosan to cleaning solutions at 1 part to 80 parts of solution. Spray Reosan neat on refuge dumps, garbage and offal dumps. Dilute 1 part to 10 parts water for use in fogging equipment. Composition A blend of nonionic, cationic and amphoteric surfactants and a reodorant.